With Le Jacquard Français, we want to suit your wish for high quality typical French jacquards. 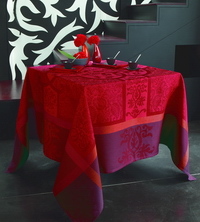 The collection includes exquisite linens for table, kitchen and bathroom. All articles have been woven and refined in the French Vosges, a traditional leash area on jacquard looms. We start with an excerpt from the latest collection.